For over 65 years, America has been “running on Dunkin”. And now you can buy a Dunkin Donuts gift card at a reduced price and get more Dunkin for fewer dollars. Serving over 3 million customers per day, this is the go-to place for coffee, donuts and more! And just think, with more than 11,000 stores in 41 states across the U.S. and the District of Columbia, you’re sure to have one close to you. Finally, fresh delicious donuts and coffee for less money! 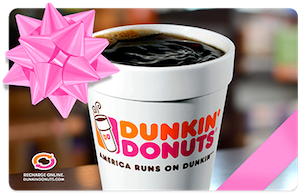 Your discounted Dunkin Donuts gift card will buy you lots of great goodies for less money! And with over 50 delicious varieties to choose from, you can easily have a new favorite every day of the week! But don’t forget, they have a lot more than just coffee. Enjoy your favorite coffee, a bagel, or even a breakfast sandwich and when you use your discounted card, you will pay less money for your entire purchase! Along with your Dunkin Donuts gift card, you can join their DDPerks Rewards program and earn 5 points for every $1 you spend. Once you accumulate enough points, they can be used for free items. What’s more, gift cards are a form of currency, so you use coupons and store promotions and still use your card to pay. And don’t forget, gift cards make super gifts! What could be better for that hard to shop for person? Whether you purchase one for yourself or as a gift, you can’t go wrong! So, fresh donuts, coffee, bagels, and sandwiches for less money. That’s a good deal, right? Why wait any longer? Buy your discounted Dunkin Donuts gift card today and start saving! And just think, you don’t have to use the entire balance on your card on one visit! Use your card time and again and save money every time! The same is true of location too! Your card is good at any of their 11,000 locations, anytime! Which sure is convenient! But that’s not all! Cards2Cash offers lots of other gift cards you may be interested in! check out our listings for Krispy Kreme, Starbucks, Baskin Robbins, Aunt Anne’s and more! At last, saving money is a snap! Do you have a Dunkin Donuts gift card you would like to sell? Great news! Cards2Cash pays top dollar for unwanted gift cards! In fact, we buy cards for everything from pet shops to restaurants! Why hold onto a piece of plastic when you can turn it into money instead? If you have a gift card you are interested in selling, stop in one of our retail locations and we’ll pay you cash on the spot for it, simply fill out our quick and easy online form and we’ll get back to you with an offer! Cards2Cash is your go-to gift card shop!